If your client is a naturally shy and retiring person then they might find it difficult to imagine being able to project themselves in a more confident manner. Or it could be that they were over-protected in childhood - or the reverse - or were hurt in some way whilst trying to express themselves when younger. Whatever the cause - your client can be just as confident as they wish to be - providing they believe that they can be so. As we know, hypnotherapy can help clients to change their belief system as well as increase their confidence in themselves. How would they like to be? Assertive? Confident? More talkative in group situations? 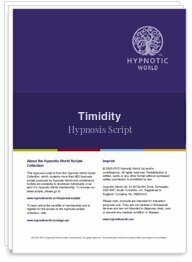 Your client has as much potential as anyone else; this hypnosis script can help them to reclaim what is rightfully theirs.